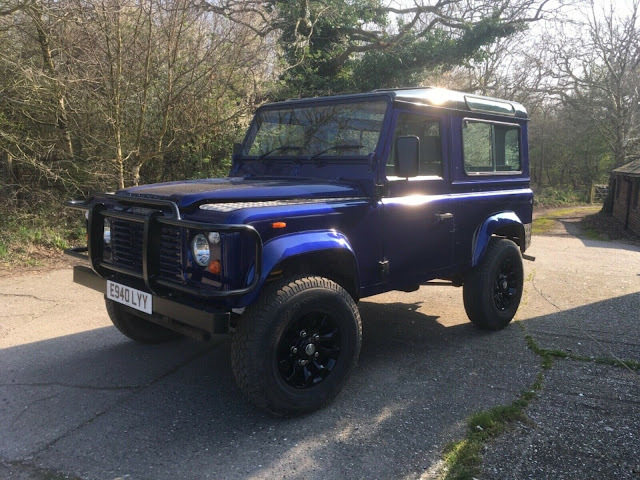 LAND ROVER DEFENDER, GENUINE 90 V8 3.5 STATION WAGON, AS STATED ON V5 DOCUMENT, YEAR 1988. CHASSIS NUMBER CLEARLY VISIBLE AS WELL AS ENGINE NUMBER, AND ALSO CORRECT TO V5 DOCUMENT. MILEAGE BELIEVED TO BE GENUINE AS I HAVE A FOLDER SHOWING OLD MOT”S AND BILLS DATING BACK TO 1995. THE ENGINE IS CORRECT AND ORIGINAL TO THIS VEHICLE, AND APPEARS DUE TO THE PAPERWORK TO HAVE ALWAYS BEEN SERVICED. MILEAGE 69741. GEAR BOX LT85 NON PAINTED CROSS HATCHED. IT HAS HAD 7 OWNERS. BODY-WISE THE BULKHEAD WAS REPLACED WITH A LATER BULKHEAD WITHOUT THE VENTS WHICH IS IN EXCELLENT CONDITION, ALL DOORS IN VERY GOOD CONDITION. THE VEHICLE WAS THEN RESPRAYED IN ROVER METALLIC BLUE, ABOUT 4 YEARS AGO. THE PAINTWORK IS ALSO IN VERY GOOD CONDITION WITH A SLIGHT SCRAPE ON THE PASSENGER SIDE AS CAN BE SEEN IN THE PHOTO. OTHERWISE THIS COLOUR IS VERY EYE-CATCHING AND STANDS OUT. 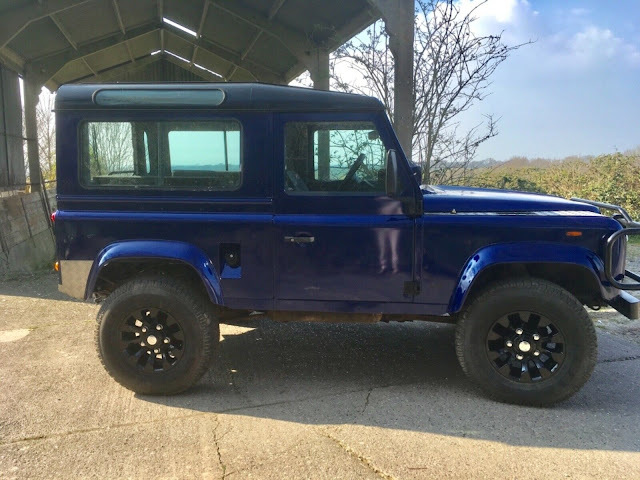 INTERIOR IS IN VERY GOOD CLEAN ORIGINAL CONDITION BUT WOULD BENEFIT FROM AN UPGRADE ROOF LINING HAS SOME SAG IN THE MIDDLE, THIS IS MOST COMMON WITH LAND ROVER. THE SUNROOF OPENS AND CLOSES EASILY AND APPEARS TO BE SOUND WITH NO LEAKS. ENGINE BURSTS INTO LIFE WITH NO SMOKE, KNOCKS OR RATTLES AND HAS BEEN SERVICED RECENTLY. THE TEMPERATURE GAUGE SITS NORMALLY WITH NO FLUCTUATIONS, 50/50 ANTI FREEZE, ORIGINAL AIR FILTER BOX AND PIPEWORK ARE INCLUDED IN THE SALE. NO LOSS OF WATER OR OIL. GEARBOX ENGAGES IN ALL THE GEARS WITH NO ISSUES. THRUST BEARING WHINES SLIGHTLY, BUT ONCE THE CLUTCH IS DEPRESSED, THE WHINE DISAPPEARS. I HAVENT DRIVEN THE LANDY ON THE ROAD SINCE LAST YEAR AS THE MOT HAS EXPIRED. ONCE THE LANDY IS DRIVEN REGULARLY I THINK THE WHINE WILL GO AWAY ALTOGETHER. THE 4 WHEEL DRIVE ENGAGES OK.
CHASSIS IS SOLID WITH LIGHT CORROSION IN PLACES. FRONT NSF MAIN RAIL NEEDS A MINIMAL OF WELDING SMALL HOLE, AND BOTH OUTRIGGERS NEED A MINIMAL AMOUNT OF WELDING, WITH A WIRE BRUSH RUN OVER THE CHASSIS IT WILL CLEAN UP NICELY WITH A REPAINT OR A WAXOYL WILL LAST FOR MANY YEARS TO COME. THE REAR CROSS-MEMBER WAS REPLACED 4 YEARS AGO AND HAS A NAS REAR STEP FITTED LAST YEAR. AN ORIGINAL LAND ROVER NEW OLD STOCK BULL BAR WAS ALSO FITTED RECENTLY. ELECTRICAL FUEL GAUGE, TEMPERATURE GAUGE, VOLTAGE GAUGE, SIDE LAMPS, HEAD LAMPS, INDICATORS, HAZARD WARNING LIGHTS, NUMBER PLATE LIGHT, BRAKE LIGHTS, REVERSING LAMP, FOG LAMP, HEATER, REAR AND FRONT WIPERS ALL WORK. IT HAD A NEW BATTERY LAST YEAR. SUSPENSION 2” LIFT KIT WITH A SET OF SAWTOOTH WHEELS WITH EXCELLENT TYRES. POWER ASSISTED STEERING. BRAKES I HAVENT USED THE LAND ROVER ON THE ROAD SINCE JUNE LAST YEAR AS THE MOT HAS EXPIRED, THE BRAKES ARE STICKING SO WILL NEED TAKING APART AND CLEANING. THE FRONT DISCS ARE PITTED AND WORN. I HAVE NEW DISCS AND PADS INCLUDED IN THE SALE. DUE TO THE AFOREMENTIONED, THE LAND ROVER WILL HAVE TO BE TRAILERED AWAY. 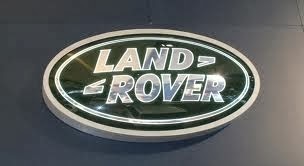 THE LAND ROVER IS ON A SORN, ALL THE PAPERWORK IS HERE WITH ME, PRESENT AND CORRECT. THE V5 DOCUMENT IS IN MY NAME, AND I HAVE A FOLDER FULL OF PAPERWORK CORRESPONDING WITH THIS VEHICLE, BILLS AND MOT’S DATING BACK TO 1995. 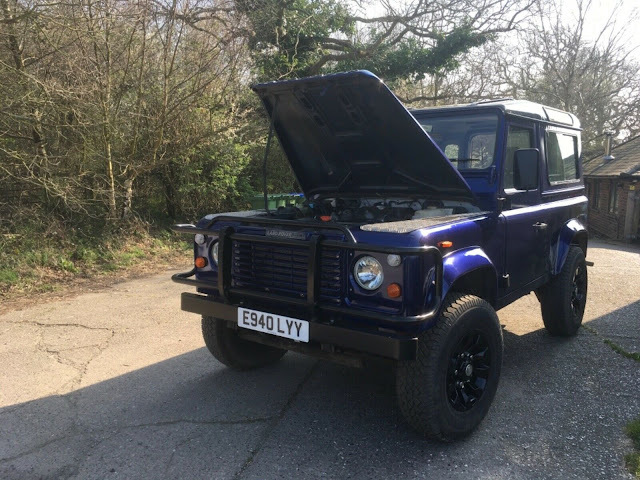 WITH VERY LITTLE WORK TO BE DONE TO THIS VEHICLE YOU WILL HAVE A VERY NICE ORIGINAL V8 LAND ROVER, THE ENGINE SOUNDS VERY MEATY WITH PLENTY OF POWER, A TRULY EYE-CATCHING LAND ROVER! THIS LANDY ALSO QUALIFIES FOR CHEAP CLASSIC CAR INSURANCE AS IT IS AN ORIGINAL GENUINE V8 STATION WAGON. RIGHT HAND DRIVE VEHICLE, MADE FOR THE UK MARKET. BANK TRANSFER ONLY. BUYER COLLECTS.